Masonen, Pekka and Fisher, Humphrey J. 1996. Not Quite Venus from the Waves: The Almoravid Conquest of Ghana in the Modern Historiography of Western Africa . History in Africa, Vol. 23, Issue. , p. 197. Perinbam, B. Marie 1986. Perceptions of Bonduku's Contribution to the Western Sudanese Gold Trade: An Assessment of the Evidence . History in Africa, Vol. 13, Issue. , p. 295. 1 Trimingham, J. S., A History of Islam in West Africa (London, 1962), 29–30; comparable generalizations may be found in many other secondary sources. 2 For a still more convoluted attempt to fit al-Zuhrī into the conquest hypothesis, involving mistranslation and speculation about une confusion de noms et probablement aussi de tribus, see Cuoq, J. M., Recueil des sources arabes concernant l'Afrique occidentale (Paris, 1975), 119. 3 al-dīn ibn al-Khaṭīb, Lisān, Iḥāṭah fī akhbār Gharnāṭah (Cairo, 1973), 1, 404–9; the Corpus draws upon this work, but not this passage (see pp. 306–8). 4 Muḥḥammad Ibn ʿIdhārī al-Marrākushī, Abū'l-‘Abbās Aḥmad b., Kitālb al-bayān al-mughrib fī afhbār al-andalus wa'l-maghrib (Beirut, 1967), ed. Abbas, Iḥsān, iv, 25. 5 The printed Arabic gives desert, in the singular; but the Corpus uses also the original manuscript. 6 The Corpus gives one index reference, 217, a mistake; there may be a passing mention, in the context of black troops in Spain, but the reading seems doubtful – see Miranda, A. Huici, Al-Bayān al-mugrib…por ibn ʿIdārīal-Marrākusī (Tetuan, 1953–1954), I, 150 n.
7 Lévi-Provençal, E., Fragments historiques sur les Berberes au moyen-âge (Rabat, 1934), 2. 8 Cuoq, , Recueil, 248–54. 9 Ṣubḥ al-a'shā (Cairo, 1913–1920), v, 284; or Cuoq, , Recueil, 372. 10 Lange, D., ‘Un texte de Maqrīzīsur “Les races des Sūdān’”, Annates islamologiques, xv, (1979), particularly 188–90. 11 This same passage places the first conversion of the Almoravids in the first quarter of the second Islamic century; might this be the origin of the apparent ‘early conversion’ references in Ibn Khaldūn and al-Qalqashandī?. 12 In Ajayi, J. F. A. and Crowder, M., eds., History of West Africa, I (London, 1971), 168 n.
13 The effect of such tacit assumptions upon historical interpretation of this area and period has been perceptively discussed by de Moraes Farias, P. F., ‘Great states revisited’, J. Afr. Hist, xv, iii (1974), 470–88. 14 Levtzion, N., ‘The twelfth-century anonymous Kitāb al-istibṣār: a history of a text’, Journal of Semitic Studies, xxiv, ii (1979), 214–15, comparing the Kitāb with al-Bakrī, remarks that the former ‘was aware of the advance of Islam in the Western Sudan’ since al-Bakrī's time, and revised some of al-Bakrī's wording accordingly (see p. 552 above). This fits exactly with the argument of this review article; but Levtzion adds that the Kitāb thus ‘reflects the twelfth-century view which stressed the important role of the Almoravids in advancing the cause of Islam in the Western Sudan’. In my opinion, the emphasis specifically upon the Almoravids is more a fourteenth- than a twelfth-century phenomenon. 15 An exception is the unjustly neglected article of Coulibaly, M., ‘L'attaque de Ghana (Xle siècle)‘, Afrika Zamani (Yaoundé), ii, (04 1974), 55–7. 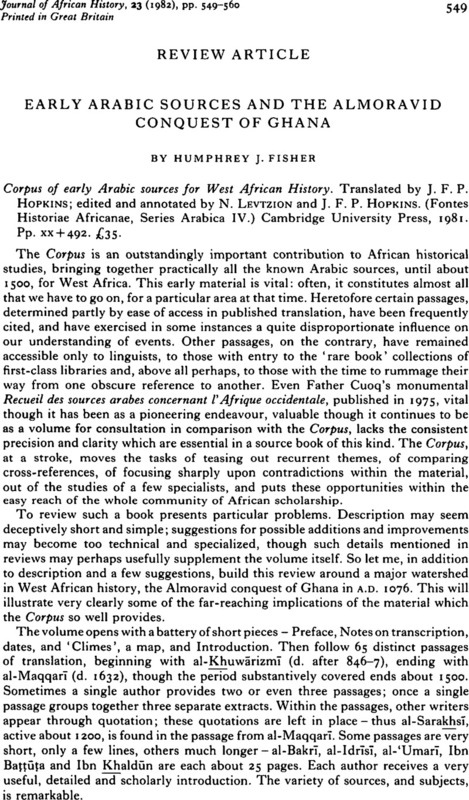 Much of the evidence and argument in the present review article, conjoined with material from the oral traditions, is examined in greater detail in D. C. Conrad and H. J. Fisher, ‘The conquest that never was: Ghana and the Almoravids, 1076’, part i of which will appear in History in Africa (1982).